Westonbirt Arboretum is a lovely garden to visit in Tetbury, in Gloucestershire. 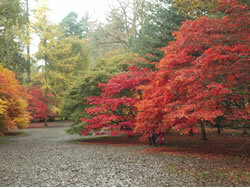 Also known as The National Arboretum, Westonbirt is located near the Cotswold town of Tetbury. Attracting some 350,000 visits each year, it is known worldwide for its spectacular colour in Autumn and it's Spring displays of rhohodendron, azalea and magnolia. The historic 'Victorian' landscape has some 16,000 trees (2,500 species) from Britain, China, North America, Japan and Chile. You can explore the Arboretum on 17 miles of accessible paths. For families there are regular activities during the holidays for children including trails with clues and nature artwork. For adults there are guided walks too. We visited the National Aroretum in August 2012 and it was a great day out in the fresh air for all of us. It is definitely worth taking some walking shoes/wellys if you have them particularly if there has been wet weather and you are planning to head off the pathways! You can see more pictures on our Facebook page from our Autumn visit. If you are planning a trip to the Westonbirt Arboretum or simply holidaying in Gloucestershire then we have put together a selection of self catering cottages, apartments, holiday flats and lodges below as well as some useful links to B&B's, guest houses and hotels to help you make the most of your stay in Gloucestershire. 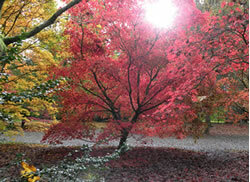 Westonbirt Arboretum can be found near Tetbury in Gloucestershire. Use the map control to zoom in or out. Please confirm the latest travel directions and details on the Westonbirt Arboretum website. See More Gardens in Gloucestershire? If the garden at Westonbirt Arboretum is not open or the location is not ideal for your holiday, then why not take a look for more gardens to visit in Gloucestershire or search for gardens by county. If you have been to Westonbirt Arboretum we, and our visitors, would love to hear about it and see some pictures. Tell us about Westonbirt Arboretum so you can help others decide.... is it worth going to, what were the best bits, how was the parking, would you do it again, would you recommend it? If you are a Westonbirt Arboretum owner and would like to add more information to this page it is completely free, we want nothing in return, just tell us about it via our Facebook page our Google+ page or our Wordpress blog and we will do the rest. If you are looking for some last minute Gloucestershire self catering apartment, flats or cottages then we recommend you call 0844 847 1143 for a great selection of properties and the latest availability and deals.